Unusual Hotels Around The World – It’s common for travelers to make the practical option of staying in an inexpensive hotel or hostel. After all, in most cases you really just need a safe, comfortable place to sleep in at the end of a busy day that’s spent sightseeing and other outdoor activities. However, some tourists do prefer to extend their pursuit of exploring and encountering new experiences to their choice of accommodations as well. This is why there is a rise in the popularity of unusual hotels. Themed hotels are popping up all over the world, and they aim to offer something new that will set them apart from other hotels out there. People are now given more options that extend beyond just a comfy bed and a clean room, to hotels that offer a unique, unforgettable experience to their customers. Oftentimes, these hotels will cost a bit more than your typical hotel and hostel, but if you’re willing to set aside extra funds for adding some extra flavor during your stay, it should be a new experience that you can add to the memories you’ll be making throughout your trip. Here are 5 notable hotels that you are worth checking in to. When they say “capsule”, they mean it literally. You basically just have bed space, and you are enclosed inside a capsule. For just around 3,500 Yen per night, you get a comfortable, enclosed sleeping space. While a bit futuristic and definitely unconventional, Capsule Inn is gaining quite the popularity among travelers and locals who travel on business who seek for practicality. Their tagline says “More reasonable than a business hotel, better sleep than an Internet café!” and it definitely says it all. Sleeping in capsules will definitely save your money. Capsule Inn is a great choice for travelers, especially backpackers who are on a shoestring budget, who don’t mind not having the luxuries of a real hotel. It may be uncomfortable at first to be enclosed in a tight space, but if you don’t have real issues such as claustrophobia, then this is a great choice that you should consider when you’re in Tokyo. For ladies, these hotels also have a “Ladies Only” floors if you are a lady traveler and would prefer some extra privacy. A popular misconception about these hotels is that only men check into Capsule Inns. But a lot of women are also considering these hotels as convenient, budget-friendly, and safe space to spend the night. Capsule Inn has several branches all over Tokyo, specifically Kanda, Shinjuku, and Shinsaibashi. In a small town in Idaho called Cottonwood, you can find a dog bed and breakfast. But, it’s not what you might think at first because it’s actually a hotel that’s shaped like a giant beagle, located in a prairie. 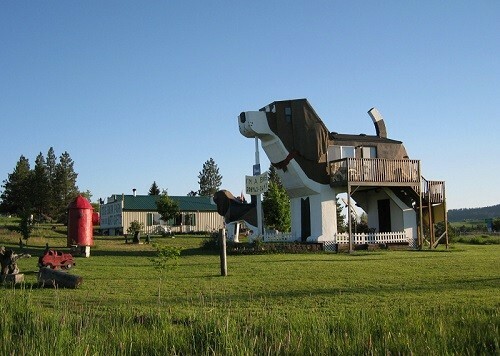 This dog-shaped inn is built by a couple, who are both chainsaw artists, back in 1997. They specialize in dog-themed art, and they initially became famous for their line of dog-shaped carvings. Earnings from these dog artworks were used to fund the construction of this inn. They only have 1 room available for $98 per night, which includes a beautiful, doggie-themed room with folk art dog décor, full amenities, a beautiful array of breakfast foods and homemade pastries, recreational activities in the form of books, puzzles, and games, as well as a relaxing atmosphere without distractions such as TVs and phones. Guests are even treated with some sweet dog-shaped biscuits for them upon checking into their room. Another highlight that guests can enjoy in this place is their family recipe of the best fruit granola, using fruits that are harvested from the prairie. This place is a must-see destination for dog and animal lovers. Dog Bark Park Inn’s booking period is only from April 1 to October 31, and since there is only one room (that can accommodate up to four people), you will have to book several months in advance. Dog Bark Park Inn is of course, friendly to pets as well, and can accommodate your furry pals for an added fee. This place offers a wholesome, fun experience that’s surely unforgettable. 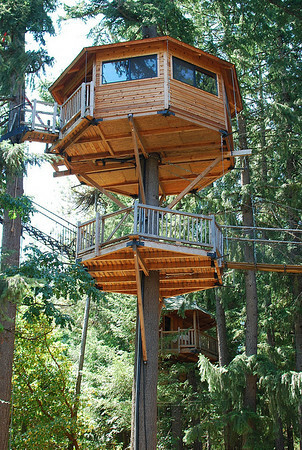 In Oregon, you can find this unique hotel that features tree house accommodations. This “treesort” offers a nature-filled, offbeat experience for outdoorsy folks, adventurers and tourists alike. Located beside Siskiyou National Forest, this bed and breakfast offers more than just cozy tree house accommodation, but also boasts a ton of activities you can do on the site. Out ‘n’ About is comprised of a total of 9 tree houses, and a series of ladders and staircases are used to access these structures. Hanging bridges and catwalks also connect some of the tree houses together. The most popular activity here is their expansive zip lines, and they have several zip lines that are highly enjoyable and offer a unique view of the forest. For adrenaline thrill-seekers, they have a Tarzan Swing is a 50 feet pendulum swing hung atop the tall trees. Rafting, tree climbing and hiking are also among the many outdoor activities you can do at this place. They also offer arts and crafts classes, volleyball, ping-pong and basketball too. There’s a lot in store for recreational activities for everyone in the family. This is a refreshing and incredible destination for family vacations, and stepping away from the city environment to get a dose of nature. For those people who are on the fence about camping, perhaps sleeping in a tree house will sound more appealing and comfortable, as some of these tree houses have built in bathrooms as well. They offer delicious, homemade breakfasts as well. Reservations to this place should be made at least a year ahead as this place gets a lot of guests for obvious reasons stated above. With eco-tourism on the rise, and people waking up to pursue more sustainable lifestyle choices, Whitepod in Switzerland is a great destination for those who would like to enjoy a more down-to-earth, nature-filled experience without harming the environment or disregarding comfort. 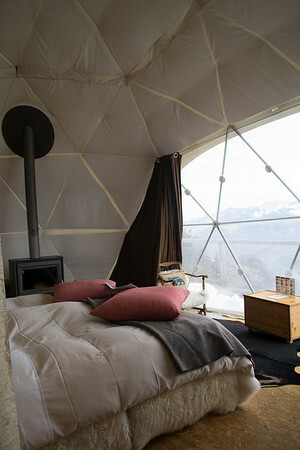 Located atop a mountain, above the village of Les Cerniers, several white “pods” or structured tents are pitched atop wooden platforms. Guests are treated to breathtaking views of the great Swiss landscape and Lake Geneva. Pods are equipped with comfortable, luxurious amenities such as organic bedding, wood-burning stove, tea kitchen, and a terrace. During winter, this place becomes a winter wonderland, filled with fluffy, white snow, and it’s a great destination for enthusiasts of snow activities such as skiing and sledding. They also have 2 wellness centers for guests who are looking for some rest and relaxation. What’s great about Whitepod, aside from giving tourists a chance to reconnect with unspoiled nature, are its advocates. They take positive steps to ensuring water and energy consumption are reduced. They promote biodiversity, and try to minimize the use of lights in the evening for the benefit of the animals and wildlife cohabiting in that area. Aside from that, the pods change in color depending on the season that enables it to blend with the surrounding nature, so it changes from green to white. They also advocate the reduction of waste by purchasing their supplies in bulk to reduce the use of single-use packaging, which then reduces the use of fuel and carbon emissions. If you’ve always wanted to sleep in nature, under the stars, but dislike the idea of sleeping inside an uncomfortable, pitched tent in the middle of the forest, Attrap’Reves in France will be very appealing to you. This hotel’s rooms are actually transparent bubbles that allow you to sleep beside nature, but still remain protected from the elements such as rain, mosquitoes, animals, and so on. These bubbles are fully furnished, with comforts of a typical hotel. Each bubble is located in a secluded spot away from all the other bubbles, which provide a sense of privacy, if that’s your concern. However, there are also bubbles that offer a bit more privacy by being just partially transparent, too. Noise-free blowers keep these bubbles inflated and acts as the air filtration and recycling system. Each bubble is equipped with a shower area and running water with a sink. Food, Jacuzzi and other amenities are available in a main building. They also have telescopes and star charts on site, which guests can use for stargazing activities. Attrap’Reves, as of this writing, has 5 locations in France: Allauch, Forcalquier, La Bouilladisse, Montagnac Montpezat, and Puget Ville. Each location has only 6 bubbles on site, which helps preserve the tranquil, serene atmosphere, and ensures that the level of privacy is always high. 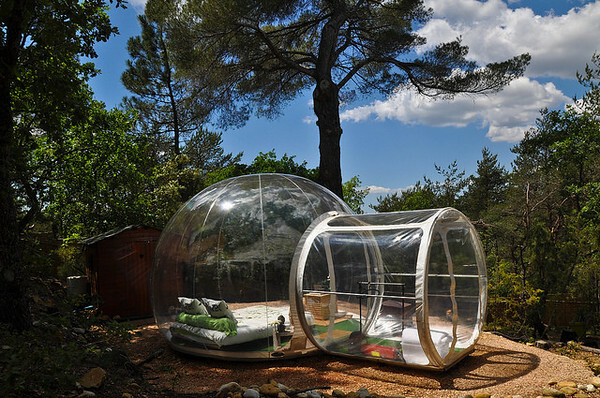 These bubble rooms are great options to stay for a unique but comfortable experience to be surrounded by beautiful, natural scenery. The next time you travel to these countries, stray away from the norm of commercial, luxury hotels, and do give these unusual hotels to your itinerary. Though, for most of these hotels you’ll have to book in advance to secure your stay, since these places draw in crowds who are looking for a unique accommodation experience. You’ve seen the photographs of beautiful Irish castles dotting the green countryside. You might have even had the good fortune to have visited some. But did you know that some of them have been converted into hotels? Even if you thought you knew all the travel secrets out there, you might have missed this one. If you’ve ever dreamed of spending a night (or two) surrounded by the magic and mystery of an Irish castle, make that dream come true! Let’s take a look at the following list of castles that have been converted into hotels. Ashford Castle in County Mayo has such a vast array of activities, no one will blame you if you don’t leave the castle grounds during your stay. Activities include golf, kayaking, archery, horseback riding, lake cruises and even falconry. For those seeking relaxation, there’s a world-class spa. There are also beautifully groomed gardens that invite visitors to walk around for hours of peaceful discovery. You can enjoy tea in the gardens, or in the huge and comfortable library packed with books. If you’re looking for more stimulation, take in a move in the private cinema. And if you’re bringing the kids, come at Halloween when the hotel transforms to a Hogwarts School of Witchcraft & Wizardry. Your children will don the Hogwarts school robes and meet new wizard friends while cooking with house elves, practicing magic, and enjoying their own special banquet before a movie. Western Ireland has a certain magic. It’s home to the Cliffs of Moher, historic castles, and breathtaking coastlines. Just minutes from the Shannon Airport and a short drive to the Wild Atlantic Way, the Dromoland Castle is the perfect place to explore these wonders. This prestigious hotel is family-friendly and offers kids clubs during peak school and summer breaks. They offer falconry, archery, boating, and a tour by jaunting car, which is a horse and buggy made for sightseeing. Not far from the castle, families can enjoy a hands-on Irish history lesson at Bunratty Castle and Folk Park. This is a special attraction featuring traditional homes brought from across Ireland to create a living history village surrounding the 15th-century fortress. Located just five miles from Dublin Airport and two miles from the heart of the city is Clontarf Castle. Situated in a quiet peaceful setting, this is one of the many Irish castles steeped in history. Dating back to 1172, it offers guests a truly splendid and royal experience. The castle’s glowing lanterns and grand turrets are a beacon to weary travelers, promising a restful night’s sleep. Rooms are available in a variety of boutique schemes from contemporary to elegant to extravagant suites with dressed four-poster beds and views of the mountains and the sea. Thoughtful touches include hand-crafted Irish toiletries from the Handmade Irish Soap Company. If you need to do a little work, there are in-room USB chargers as well as U.S. and European sockets for international guests. The Ballynahinch Castle is an unpretentious castle hotel set on a private 700-acre estate of woodland, rivers, and trails. Located in the heart of Connemara County Galway, the castle is near a famous salmon fishery and is surrounded by the beautiful 12 Bens mountain range. During your stay, expert guides are available to assist in every activity offered by the hotel. When you’re ready to take a break, relax by one of the six open-log fires. Or, settle into the library to explore the rich culture of the region. If you’d rather explore local attractions, hop in the car and drive the Wild Atlantic Way to see Killary Harbour, Inishbofin, Sky Road and Roundstone village. Lough Rynn Castle Estate and Gardens contains the ancestral home of the legendary Lord Leitrim and his family, the Clements. The sprawling Victorian manor in Western Ireland was one of the finest homes during the era. Situated on 300 acres of deep green grass, ancient trees, and a stunning shoreline, the manor is now a 21st-century destination that maintains the charm, elegance, and glory of that time period. Each luxurious bedroom in this Irish castle is tailored for maximum enjoyment and complete comfort. And, when it’s time for fine dining, there are many options. Whether you choose the revered Sandstone Restaurant, the secret Dungeon Bar, the Drawing rooms or Lord Leitrim’s own Baronial Hall, you will be taken care of in style by some of the best chefs in Ireland. If a requirement for your vacation is not only exploring Irish castles but also practicing your golf swing, then Waterford Castle fits the bill. This is one of the most stunning Irish castles. It is located in Ireland’s Ancient East on a 310-acre private island on the River Suir. Not only is the 16th- century castle surrounded by gorgeous woodlands, but there’s also an amazing 18-hole golf course. The island is accessible via a short crossing on the resort’s private car ferry over the King’s Channel. Once you settle into the hotel, you’ll find that the Waterford combines the gracious living of an elegant past with every modern convenience of today. The castle’s interior features beautiful antique furniture, original oak paneling, and a one-of-a-kind Elizabethan Stone fireplace. Just a one-hour drive from Dublin, Cabra Castle is enchanting. Set on 100 acres of parkland and garden and surrounded by a 9-hole golf course, if offers so much to explore both indoors and out. Wander through the magnificent reception rooms, or find a cozy corner or fireside to relax with a book. Period furnishings and features create an authentic, old-world charm from a bygone era. This Irish castle is surrounded by Dun a Ri Forest Park and the scenic trees that make up the Caravan countryside. The whole scene gives you the effect of being catapulted back in time. Because it’s such a lovely location, Cabra Castle is also one of best-known castle wedding venues in Ireland. It’s Time to Experience These Gorgeous Irish Castles! Pack your bags and prepare for your journey to the Emerald Isles. Then, immerse yourself in the warm and friendly culture, beautiful scenery and the once-in-a-lifetime experience of staying in a historical Irish castle. It’ll be a journey you’ll never forget! Check in with us often for more expert travel tips and advice! The Capsule Inn in Japan has stirred up my curiosity ever since I saw a friend of mine who visited the place but only to take a picture but not experience it for the night. Sweet article. The dog bark park inn made me giggle. Haha well it sure made me realize that a house doesn’t necessarily need to look like one..! Yeah, looks like an incredible view over Paris from that place! I just found out they have removed it from there now, I hope they will bring it back soon, or choose a new destination!